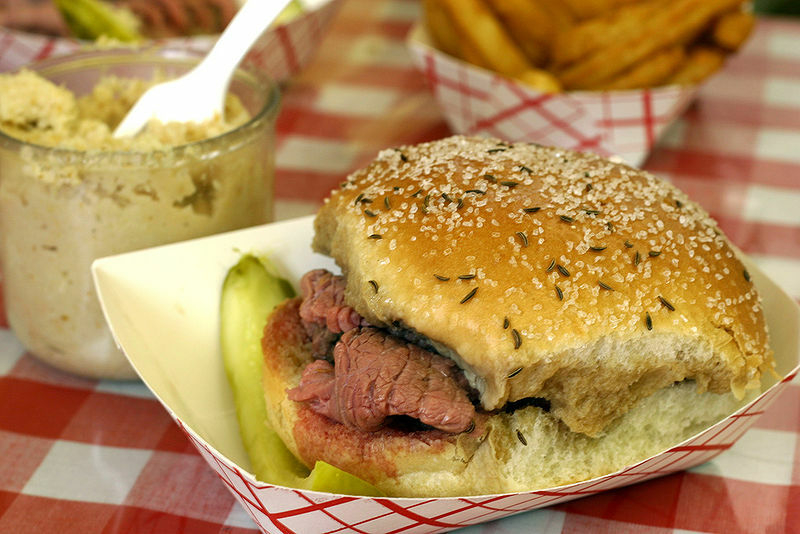 A beef on weck sandwich is made with roast beef on a kummelweck roll and is a tradition in Western New York. The meat on the sandwich is traditionally served rare, thin cut, with the top bun getting a dip au jus. Accompaniments include horseradish, a dill pickle spear, and fries. Left: A traditional beef on weck sandwich. The kummelweck roll gives the sandwich its name and a distinctive taste. A kummelweck (sometimes pronounced "kimmelweck" or "kümmelweck") is similar to a Kaiser roll, but topped with kosher salt and caraway seeds. Kümmel is the German word for caraway, and weck means "roll" in the south-western German dialects of the Baden and Swabia areas (northern Germans generally say Brötchen). The sandwich has been introduced to new areas of the United States with population movement. A typical beef on weck sandwich is made from slow-roasted rare roast beef that is hand carved in thin slices to provide about 1/2 inch (2 cm) of meat on the bottom half of the roll. The cut face of the top half of the roll may be dipped in the jus from the roast. Prepared horseradish is usually provided for the diner to spread on the top half of the roll to taste. The traditional side dishes for a beef on weck are french fries and a kosher dill pickle spear.